Tripp Lite's SMX1500XLRT2U intelligent, line interactive rack/tower uninterruptible power supply prevents data loss, downtime and equipment damage due to power outages, voltage fluctuations and transient surges. Requires only two rack spaces (2U) in a standard rack enclosure. Large internal batteries offer 18 minutes half load runtime and 7 minutes at full load. Runtime is expandable with optional BP36V15-2U external battery pack (limit 1) or BP36V42-3U (multi-pack compatible). Maintains regulated 230V nominal output without using battery power during brownouts and overvoltages from 151 to 282V. 1500VA/1000 watt power handling capability and full time sine wave output offers guaranteed compatibility with networking, telecom and other sensitive electronic applications. Includes a total of 8 outlets with 3 load banks that are individually switchable via software interface to reboot select equipment on demand or shed less significant loads to extend battery runtime for more critical equipment. Supports simultaneous remote monitoring of UPS and site power conditions via built-in USB and DB9 monitoring ports. Includes PowerAlert UPS monitoring and unattended shutdown software with complete cabling. Built-in accessory slot supports SNMP with optional SNMPWEBCARD adapter. Emergency Power Off (EPO) interface offers option for instantaneous power-off of UPS and connected equipment in the case of fire or emergency. Multi-function audible alarms and set of 5 front panel LEDs offer at-a-glance notification of UPS and line power status. Network-grade AC surge suppression protects equipment from damage and performance problems resulting from transient surges and line noise. Attractive all-black color scheme. - SMX1500XLRT2U line interactive UPS offers battery derived sine wave AC output during power outages, voltage regulation during brownouts and overvoltages, plus network-grade AC surge suppression. - 1500VA/1000 watt power handling capability with full-time sine wave output offers guaranteed compatibility with networking, telecom and other sensitive electronic devices. 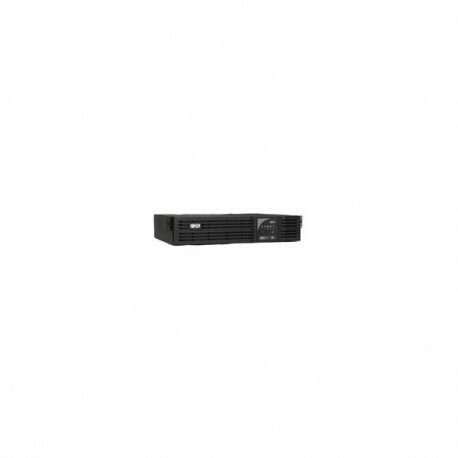 - Supports 2U rackmount installation in 4 post equipment racks, 2 post rackmount installation requires 2POSTRMKITWM, upright tower installation requires 2-9USTAND accessory. - Large internal batteries support a max load of 1500VA for 7 minutes and a half load of 750VA for 18 minutes. - Expandable runtime with BP36V15-2U (limit 1) or with multiple BP36V42-3U rack/tower external battery packs. - Includes 8 UPS supported outlets arranged in 3 individually controllable load banks (2 outlets per bank) that can be powered off and back on again via software interface. - IEC320-C14 input connection accepts a variety of detachable cordsets to match country or site-specific wall receptacles. - PowerAlert UPS monitoring and unattended shutdown software enables configurable network broadcast messaging, email notification, event logging and running user-defined script commands. - Offers simultaneous monitoring by up to 2 directly-connected devices through included USB and DB9 interface ports, or the monitoring by any number of additional servers over IP with included PowerAlert monitoring software. - Emergency Power Off (EPO) interface with cable. - Supports timed inverter shutoff after unattended shutdown, activate self-test and UPS output power control for delayed or immediate reboot of connected devices. - Supports Tripp Lite's WatchDog software application to restore operation to locked equipment through soft reboot of application, OS or hard power off/on reboot of connected equipment - ideal for unattended kiosk applications (requires optional WATCHDOGSW). - Built-in accessory slot supports SNMP with optional SNMPWEBCARD adapter. - Multi-function audible alarms and set of 5 front panel LEDs. - Network-grade AC surge suppression. - Attractive all-black color scheme. - UPS battery set ships fully assembled, no time consuming connection of internal batteries by user is necessary.